Downtown Bellevue is so beautiful. Their buildings look like heritage buildings, but also has a very modern edge to them to keep things interesting. They also have lots of awesome restaurants!! One such restaurant is John Howie Steak, a pretty swanky steakhouse that makes Hy’s Encore here in Vancouver look like the Keg (just a little). However, just like Hy’s, the servers all wear white butcher coats, and are extremely well-versed in regards to their menu. And of course, the service was impeccable. Although our server did forget to bring us a salad that we ordered, she made it up by bringing us two on the house. 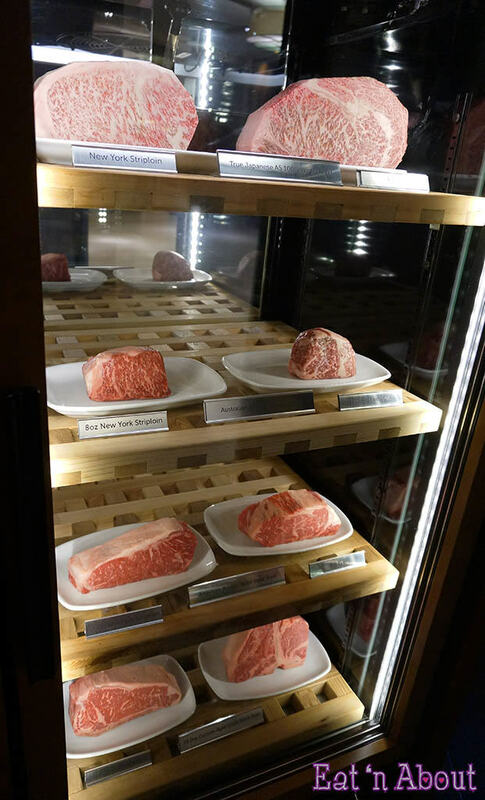 After you walk past the entrance, you are greeted with a meat refrigerator showcasing the different cuts of meats they offer. It was very interesting to actually see the differentiation in marbling and redness. 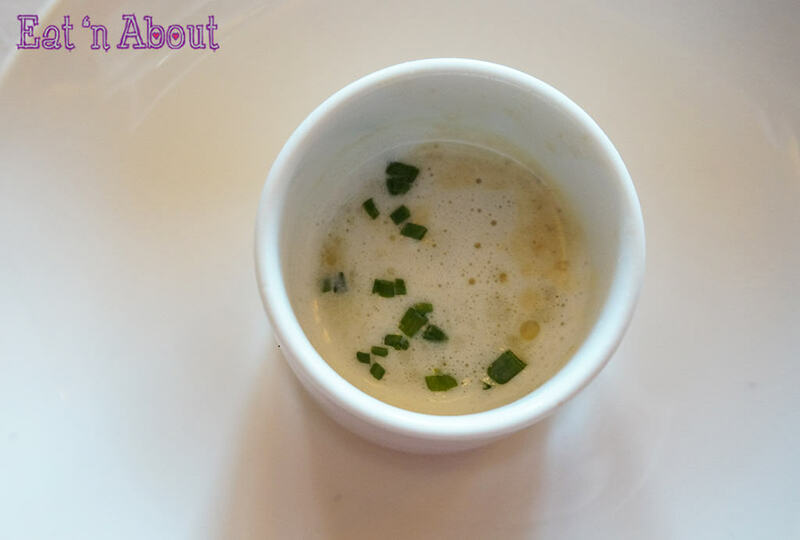 As with most swanky restaurants, we were presented with an amuse bouche of Porcini mushroom soup with truffle cream and chives. It was very creamy but I couldn’t taste enough of the mushroom in there. We ordered quite a bit of appetizers. This is the Tableside Wagyu Beef Tenderloin Tartare ($21) with red onion, caper, sweet gherkin, quail egg, roasted garlic, herb aioli, Guinness stone ground mustard. At least that’s what it says on their online menu now. There’s also pine nuts. With the food that’s designated “tableside”, they bring it to a bench-like table at the side of your table, and does the final preparation there. 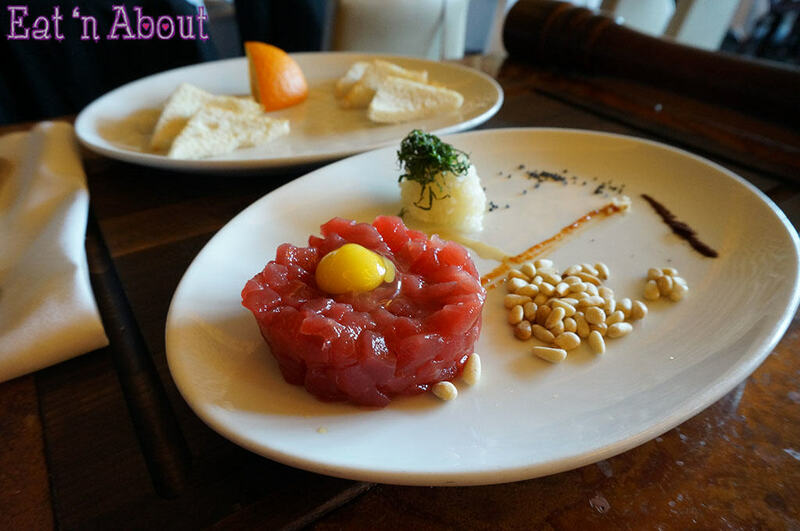 For this tartare, that involves mixing everything all up and then putting it onto another plate where the toast points were. The tartare was very tender and melted in your mouth. I loved the aioli. Pine nuts added a good nice soft crunch, but I wished there was more of a ‘beef’ taste to the meat. That’s not to say this was not an awesome dish though. Second appy was the Roasted Bone Marrow ($16) with porcini jam, a lovely but small portion of parsley salad, and mesquite grilled ciabatta. 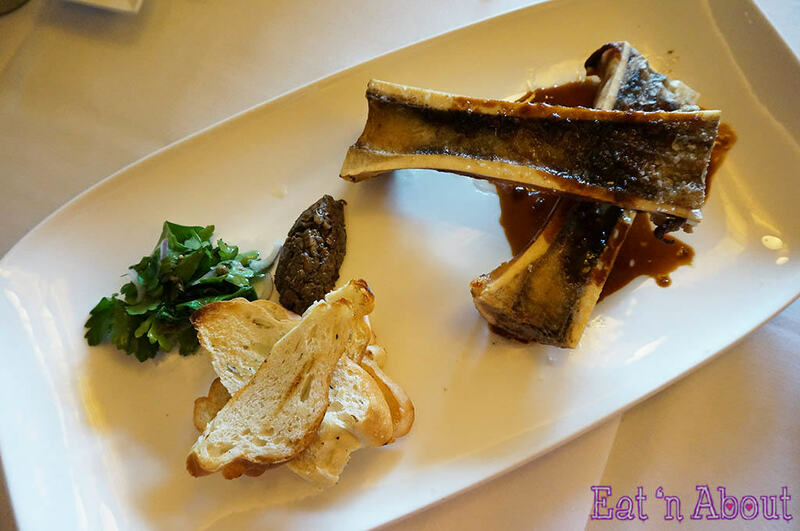 There was definitely more marrow in these bones than the one I had at Merchant’s Oyster Bar. It was rich and aromatic as expected, and there was actually enough for the 5 of us to share. The flat-leaf parsley salad was a great complement to counteract the fatty mouth-feel. Another great choice. Aunt Aggy chose the Seared Sea Scallops ($18), served on top of creamed ramps, pickled morel mushrooms, and topped with crispy coppa. I found these just slightly overdone, and the cream sauce overpoured the delicate scallops. 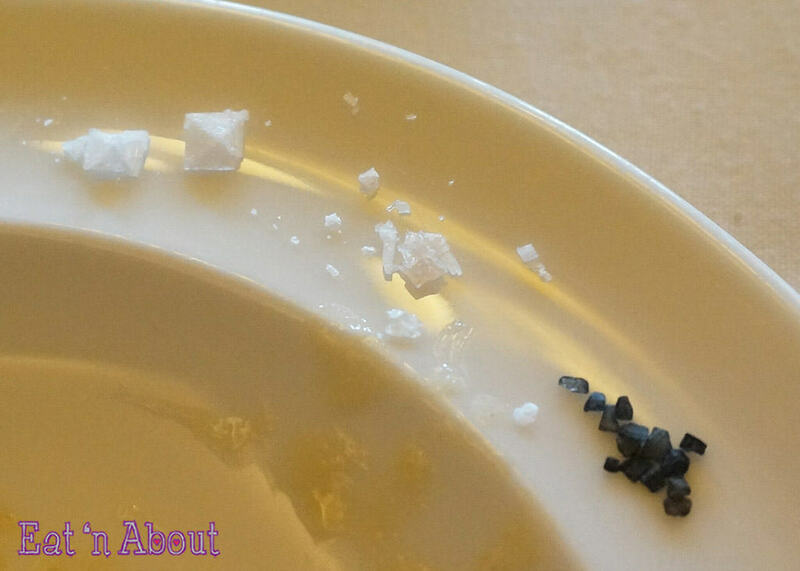 To accompany our food, we were brought a tower of gourmet sea salts. 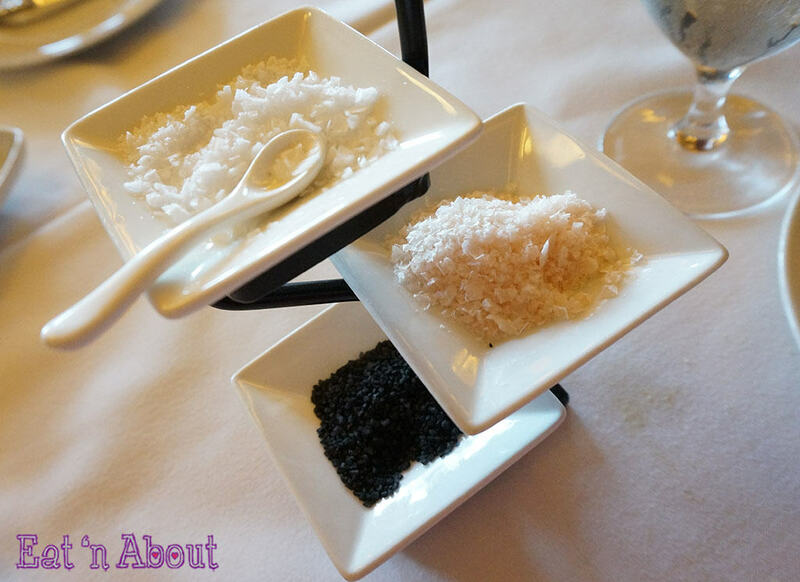 From the top is the pure white Portuguese Flor de Sal, the light pink Murray River Australian salt, and the Black Hawaiian Lava salt. You can read all about them here. Their pyramid form really intrigued me and really brought the whole dining experience up a notch. D and I picked something from the “Tableside for Two” section. 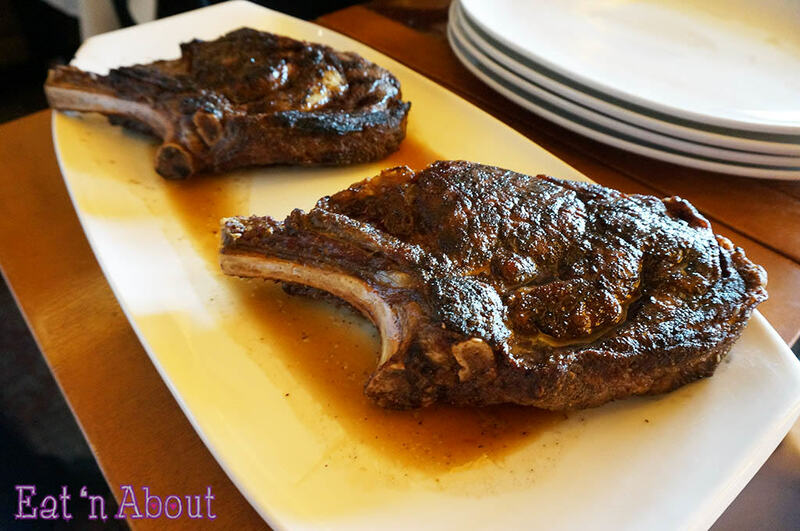 We decided on the 36oz USDA Prime Bone-in Rib Eye Steak ($102). Like all other “tableside” choices, this was shown to us then taken to the side and cut up for us into smaller pieces. My god was this a delicious steak. I have to say this rib eye is the most flavorful and rich, beefy tasting meat I’ve ever tasted. Even better than the Keg. The tenderness aside, it was just so packed with…um….beefy flavor…I just can’t describe it! You gotta try it!! 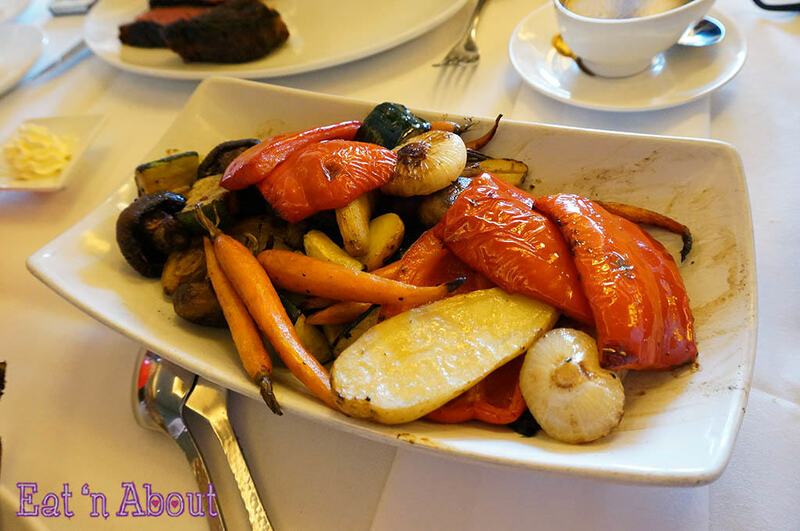 The oven roasted vegetables that came with the steak was equally awesome. There was an assortment of carrots, jerusalem artichokes, peppers, little onions, and zucchini, all roasted to a perfect softness. I especially loved the onions. 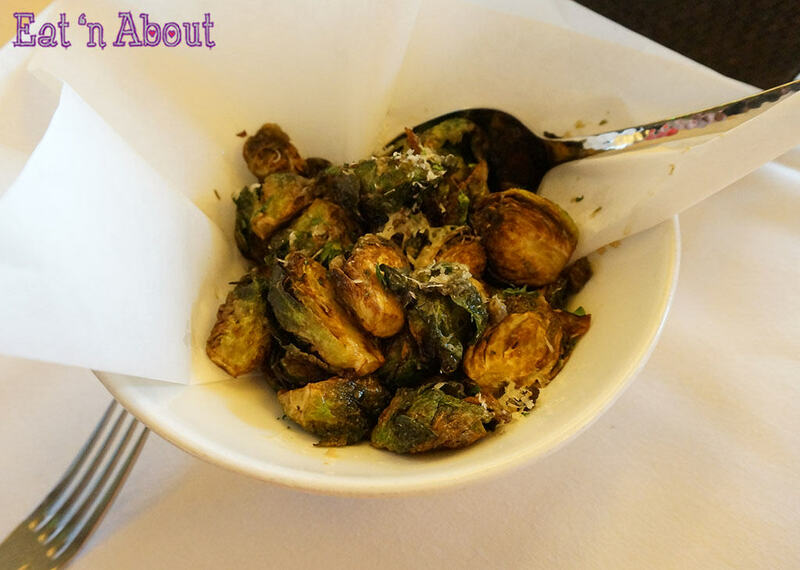 As an additional side, I ordered the Fried Brussels Sprouts ($11). THESE WERE SUPER DUPER!!! I loved the lemon caper vinagrette, which cut the richness of the “deep-fried”ness and the Parmigianno Regianno was a lovely touch. I only wished I wasn’t so full so I could eat more of it. This was the forgotten salad (the one the server forgot to bring us). 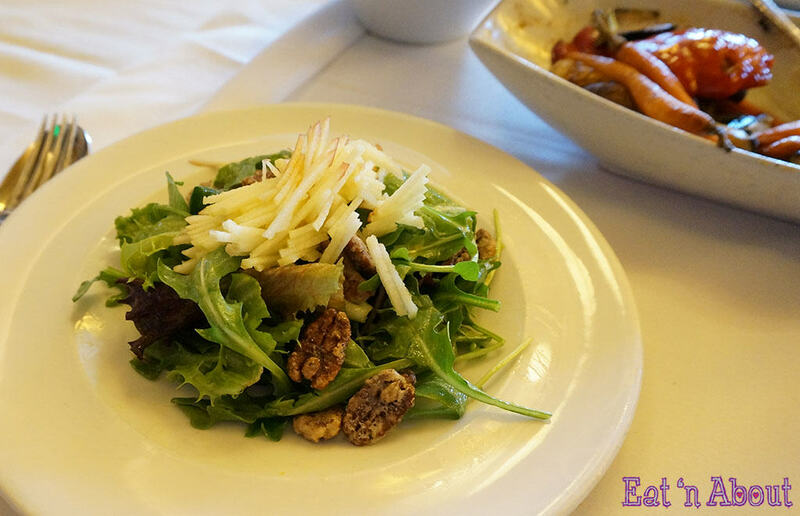 The elements of this Strawberry Apple Salad ($11) were a mixed green salad with green apple, strawberries, and marcona almonds. It was very tasty, as with most of the other food here! 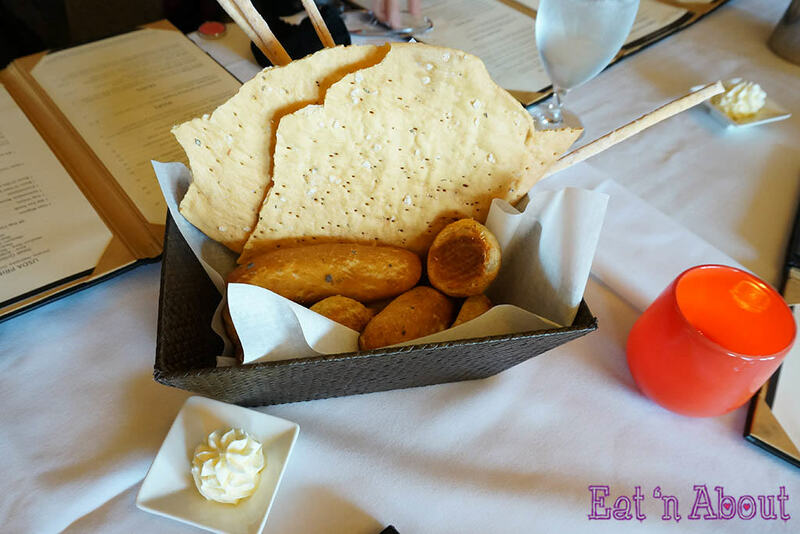 To relieve the richness of the main courses, I felt like something tart, so I suggested we share the Meyer Lemon Pie ($8). The meyer lemon curd sat in a yummy graham cracker crust. White chocolate drizzle, vanilla creme and strawberry coulis finished it off. I loved that it was not too sweet, and the curd was citrusy just the way I had envisioned it. It was Aunt Aggy’s birthday hence the candle. 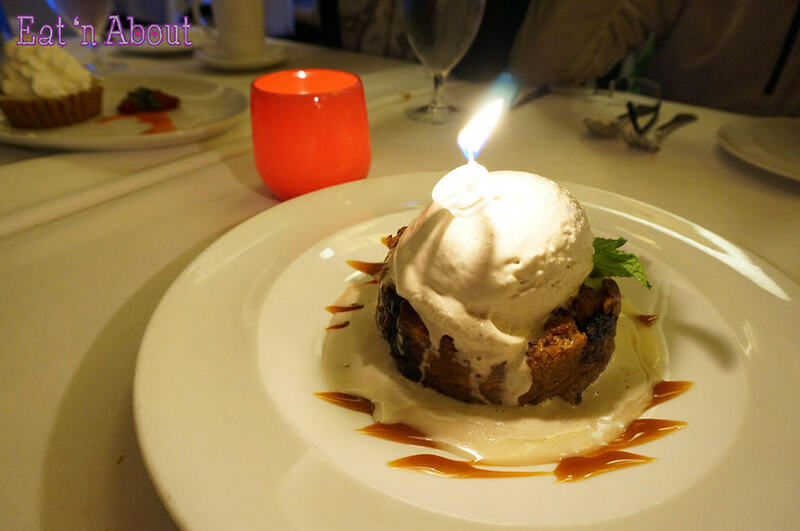 The Bourbon Soaked Black Cherry Bread Pudding ($8) was also a perfect end. I love cherries in anything. The bread pudding was moist and gooey and sweet. There was also a good amount of cherries in this. Man I really really enjoyed my dinner here. I would gladly come back again. Thanks Cousin D for taking us here!